As Pend Oreille County Assessor, I’ve received a number of inquiries that highlight a broad misunderstanding of how our property taxes are determined and where limits apply. The best way I know to explain Washington’s property tax system is with a simple illustration. 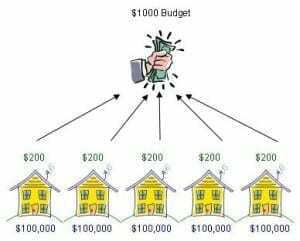 Imagine a little city that consist of four homes, each exactly the same, and each appraised by the Assessor at $100,000. Let’s also say that the annual city budget for our imaginary city is $1,000. To raise the amount of the budget, each homeowner must pay $250. Four homes each paying $250 raises $1,000. Our property tax system is budget based. We tax enough to raise the amount in the budget. No more. Let’s say next year’s budge remains at $1,000, but the Assessors doubles the assessed value of all the homes to $200,000 each. Do the taxes on each of the homes change? No. To raise the budgeted amount, each must still pay $250. In this example, the assessed value of each home doubled, but the tax didn’t change. Now let’s get a bit more realistic and say that the values on the homes change differently. Suppose one home goes from $100,000 to $150,000. Two homes double in value to $200,000 and the last home jumps to a whopping $250,000! Now what happens to the taxes? Well, the average value of the four homes is still $200,000. So the taxes on the two homes that go to $200,000 are unchanged. They are at the average and they each still pay $250. The lowest valued home sees its tax go down to $187.50, even though the assessed value goes up 50 percent! The home that jumped 150 percent to $250,000 in value sees its property tax go up to $312.50, a 25 percent increase. In the end, we still only raise $1,000 total to meet the budget. Interesting right? But wait. Normally budgets don’t stay the same; they go up, right? Back in 2000, Washington State voters approved Initiative 747. I-747 limited annual budget increases to 1 percent unless voters approve a greater increase. In our imaginary city, the $1,000 budget can only increase 1 percent to $1,010 the following year unless the voters who live in the city approve of higher increase. Our imaginary city gives simple illustrations of our property tax system. In realty, it’s not so simple. In Pend Oreille County, there are about 16,000 properties (all different from each other), over 50 tax code areas, and more than 30 tax districts. Although each property is in one tax code area, each property is in a number of tax districts because tax districts overlap. For instance, your next door neighbor could be in a different fire district or school district, etc. The result is that even though you live right next to each other, you could be in different tax code areas, and have totally different tax rates. The tax districts in Pend Oreille County are comprised of the state, county, cities, fire districts, hospital districts, cemetery districts, library, sewer and water districts, resulting in 52 tax code areas. Each tax district has an annual budget. To further complicate taxes, three school districts cross county lines. Also some property that crosses county lines, such as railroad property and telephone lines are assessed by the state. We also assess and tax business personal property. And we process senior and disabled exemptions and farm and agricultural valuation reductions. Pend Oreille County’s property tax system operates just like our imaginary little city, but on a much larger scale and with all these additional factors. Nonetheless, our computer systems allow very accurate calculation of property taxes. Most taxpayers who call my office believe there is a limit on increases to assessed values. Not so. Assessed values are driven by the real estate market. The limit is on the annual budget increase of tax districts. I have one more illustration that I think would be useful in our discussion. Let’s look at what happens if someone moves into our little city and builds a new house. If we again say the assessed value of each home is the original $100,000 but add a new home, look what happens to the individual property tax on each home. Five homes supporting the $1000 budget means each home now pays only $200 each. While growth brings more demand for government services, and is likely to push up demand for a greater budget, the initial effect is decreased taxes. Now let’s discuss appraisals. In assessor jargon, Pend Oreille County is known as an “Annual Reval County”. That means all property is to be adjusted to fair market value every year. We inspect and reappraise only 1/4th of our county each year. All property is valued based upon the sale of comparable homes. Even with our real estate market slowing somewhat in 2008, prices have continued to climb. So what happens if the real estate market “bubble” bursts and prices begin to decline? Will the assessed value decline with it? The answer is yes. We will follow the market. But remember the examples above; we will still raise the amount of the budget. Declining values would not necessarily mean lower taxes. I hope this discussion helps you understand how our system works. You control your taxes at the ballot box. It is vitally important that we carefully consider all levy issues we are asked to vote upon.